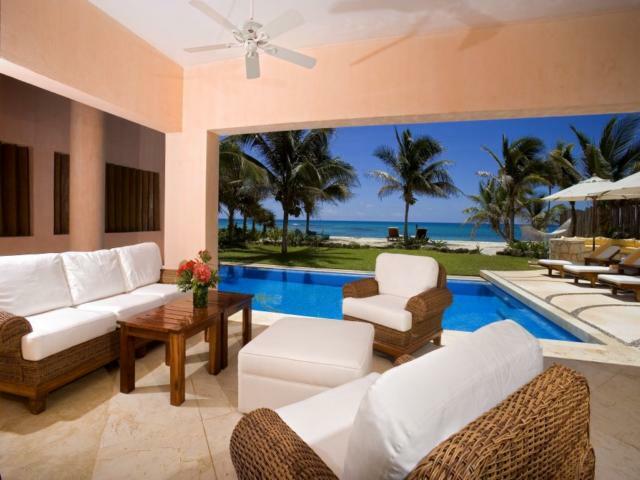 Villa Palmilla, a stunning masterpiece of a home, is situated on a gorgeous sandy beach in Jade Bay. 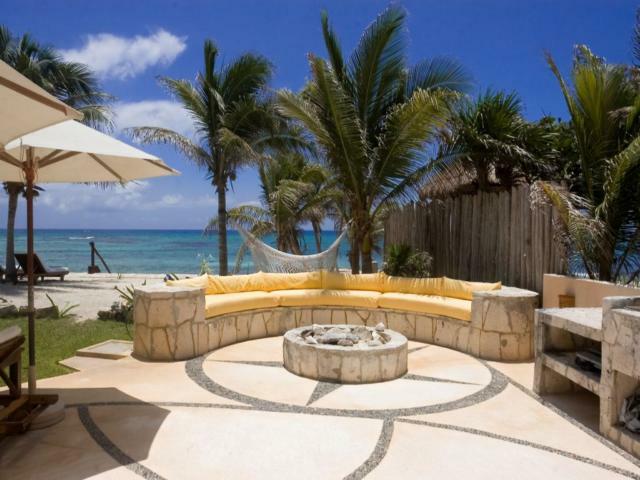 This truly amazing villa offers everything one could ever wish for a special holiday on the Mexican Caribbean. 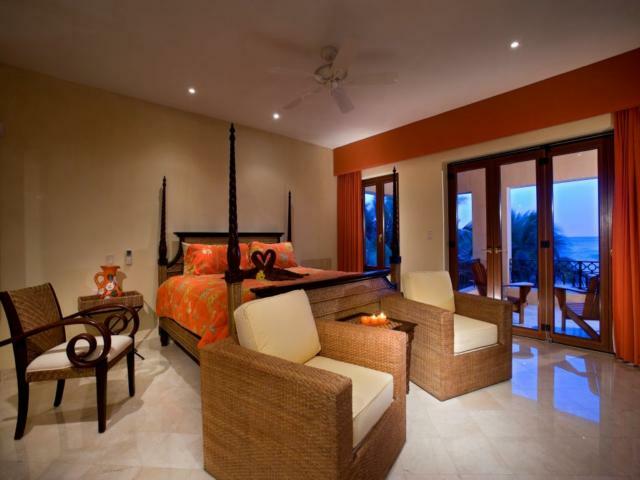 The owners of Villa Palmilla have thought of every detail in creating a well thought out, custom built luxury vacation home! 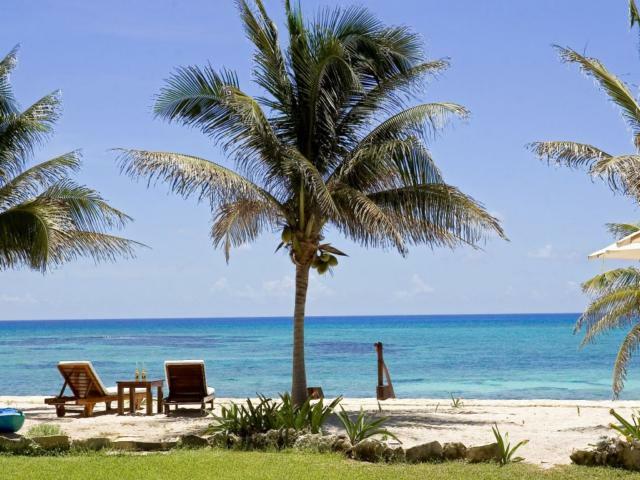 Villa Palmilla Casa La Via is 5 mins from Akumal, 20 mins to Tulum, 15 minutes from Puerto Aventuras and 30 mins to Playa del Carmen, by car! Walking through the entrance you will find yourself standing in a lush, shaded garden containing lush, tropical foliage. 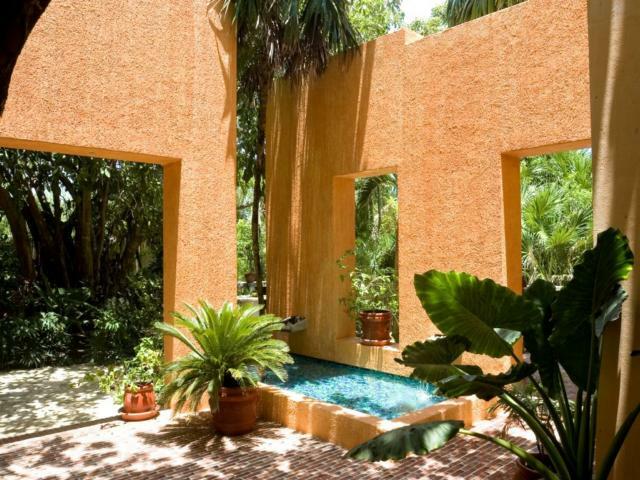 The walkway to the front door leads past a small rock pool, surrounded by potted plants and palms, where two fountains soothingly spill trickles of water into the aqua pool below. What a splendid experience this has been so far, and this is only the beginning! Leaving the garden behind while opening the giant mahogany front door, you will immediately find yourself standing in a vast living area characterized by subtle, yet unquestionably tasteful elegance. To the right of the entrance is the fully stocked kitchen with walk-in pantry. The kitchen is accessorized with black granite countertops, separate stand alone refrigerator and freezer units, and a deluxe double oven. Tucked inside the central kitchen bar with three beautiful wicker stools is a custom made, built in refrigerated wine chiller. 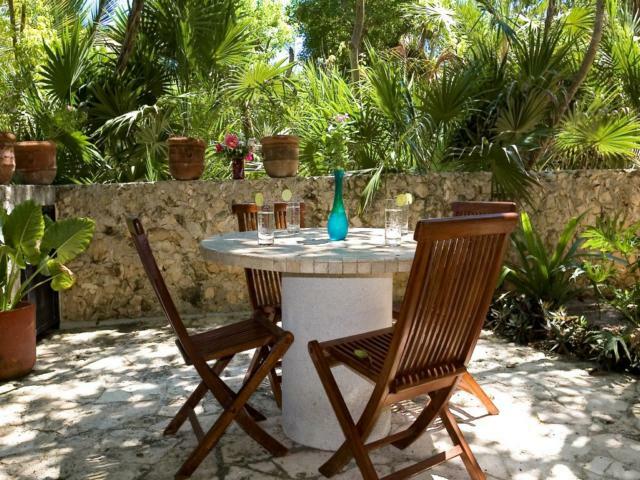 Enjoy scrumptious meals on a beautiful 8 person dining table made of Chechen, a lovely wood indigenous to the Yucatan Peninsula. 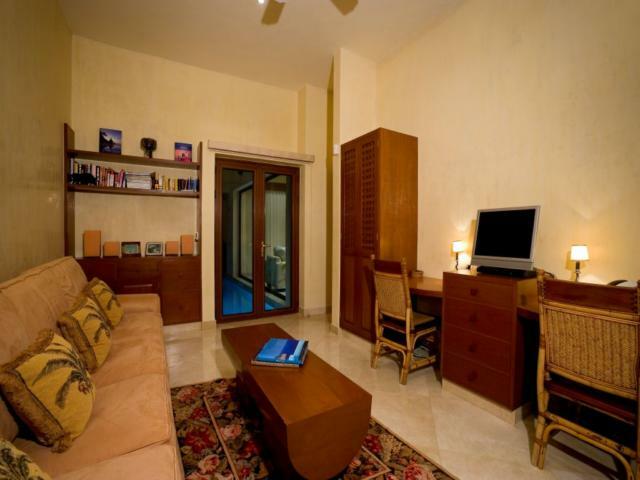 To the left of the entrance is the living area filled with exquisitely comfortable furniture, a color satellite TV, VCR, DVD player, and a five disc CD changer. 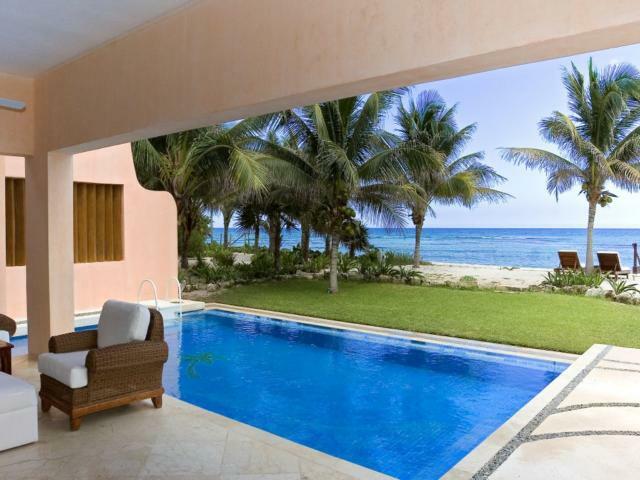 This expansive room, which joins with the kitchen and dining area, features two floor to ceiling glass walls overlooking the spacious pool with a lap swimming section and the inviting aquamarine waters of the Caribbean ocean. Stepping out into the back yard is yet another incredible experience. 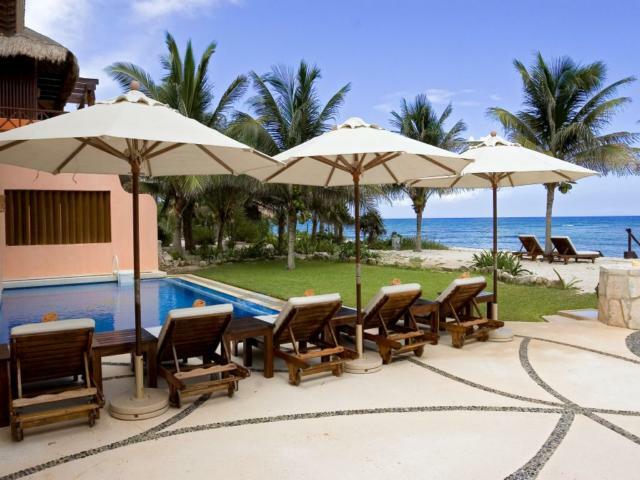 Many comfortable chaise lounge chairs around the pool with three large umbrellas ensure that no one misses out on the sun and fun. For those who need to take a nap in the shade, there is plenty of cushioned furniture on the balcony both upstairs and downstairs under the ceiling fans. Surround sound speakers in the downstairs balcony add the perfect relaxing touch to enjoying your poolside pina colada! As you ascend the mahogany and wrought iron stairway, you enter a stunning marble hallway filled with two rows of decorative windows facing the front garden. These gorgeous windows are from Germany, as are all the windows in Villa Palmilla, and offer the utmost in security and weather protection. Three bedrooms branch out from the hallway, all of which are stocked with quality linens and are extremely spacious with sitting areas and ensuite bathrooms. 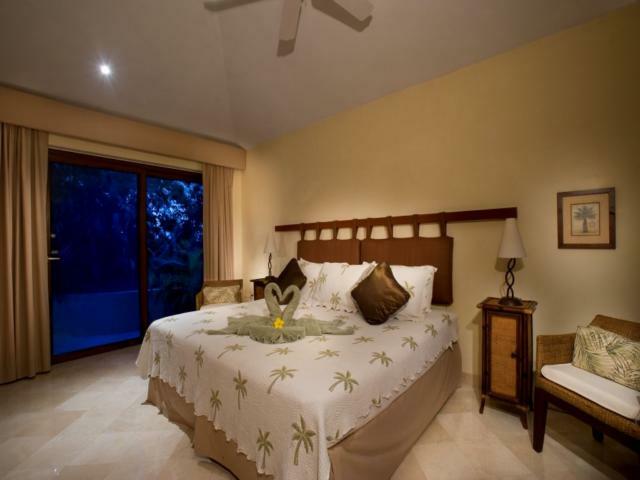 The master suite has a king bed and gorgeous balcony with a spectacular view of the ocean. A high powered, free standing telescope is available for the avid stargazer. The artwork in the villa is absolutely stunning! 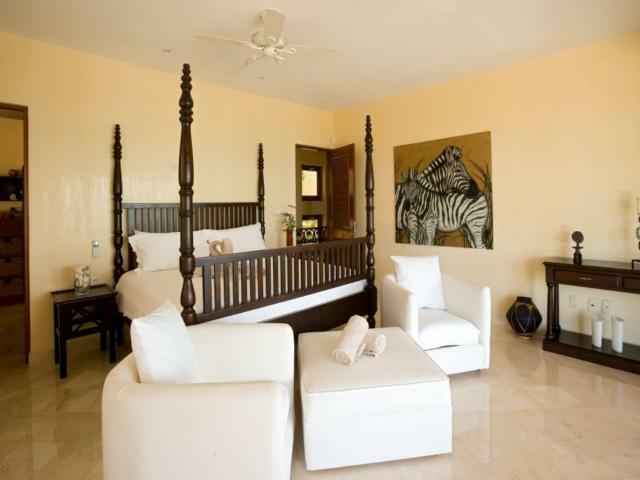 The master suite has an amazing life-like zebra print. Enough said, you will simply have to wait and see the other prints upon your arrival. 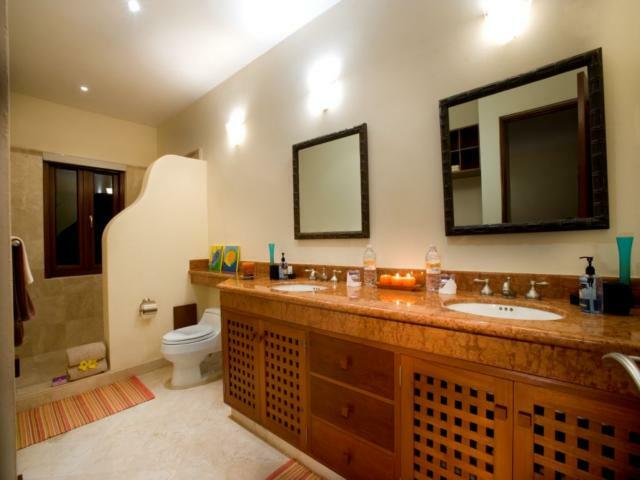 The master bath has an incredible sunken spa tub with a view of the turquoise ocean. 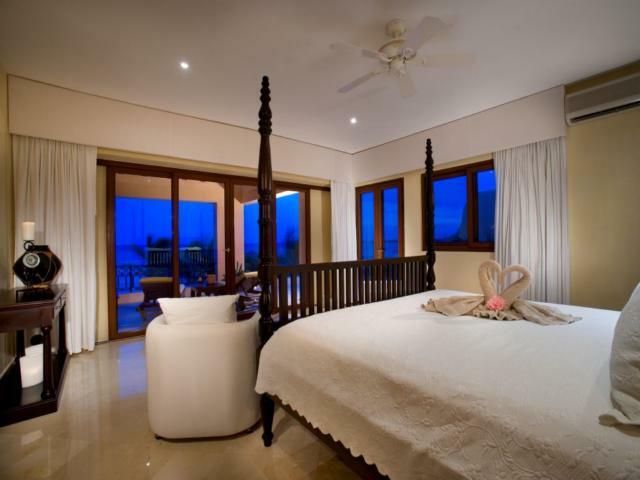 The first guest suite also has a king bed and shares the same lovely balcony and amazing ocean view as the master suite. The second guest suite has two twin beds that can be made into a king size bed, complete with satellite TV. 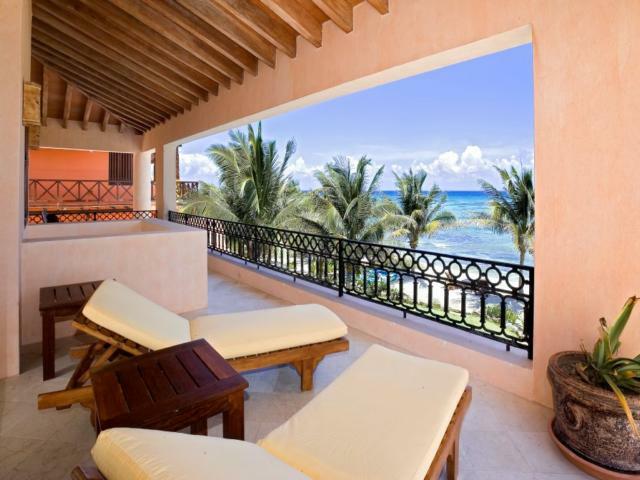 This suite has its own separate balcony with a lovely view of the ocean. All of the bathrooms have marble countertops and all of the shower heads both inside and out are from Italy. A safe for storing valuables is located in each bedroom. There is a fourth room downstairs that is a combination office/TV room with two computer desks and satellite TV. A huge, luxury, camel suede sofa makes a double bed. Opening the sliding glass doors leads you directly to the lap section of the swimming pool, ideal for the swimming enthusiast. 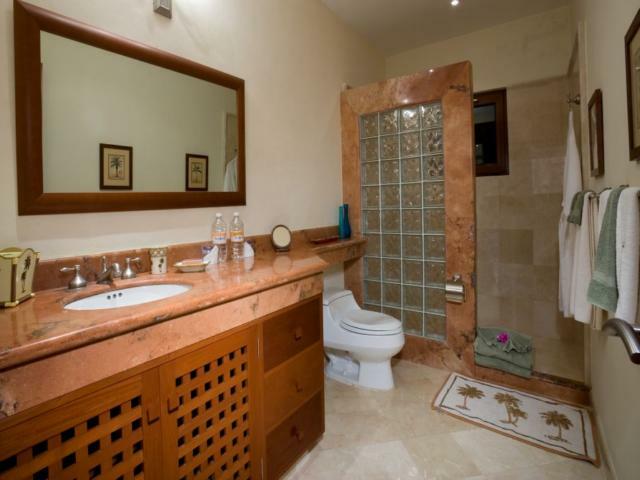 Adjacent to this room is the fully equipped powder/bath room with a shower. 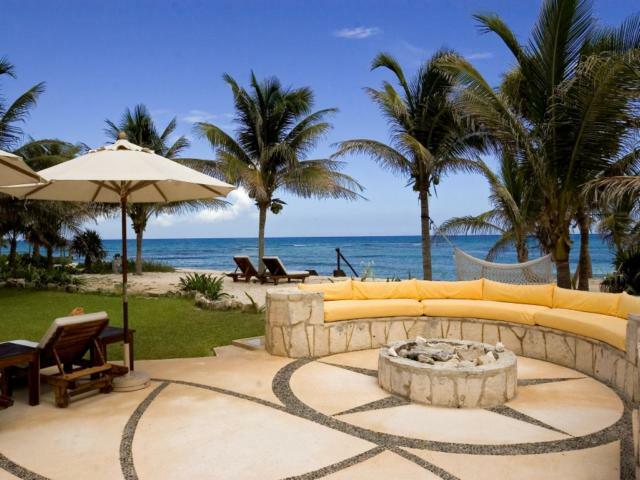 The carefully planned details that make this villa so spectacularly unique must be seen to be believed. 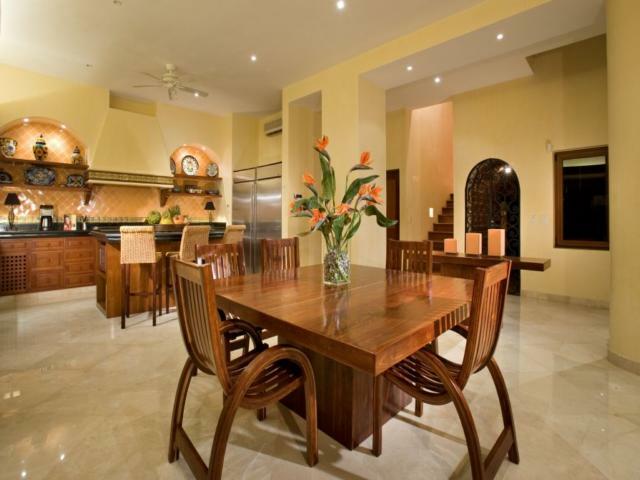 The owners of Villa Palmilla built this haven as their personal retreat and thus have constructed, furnished and finished their house using only the finest materials. 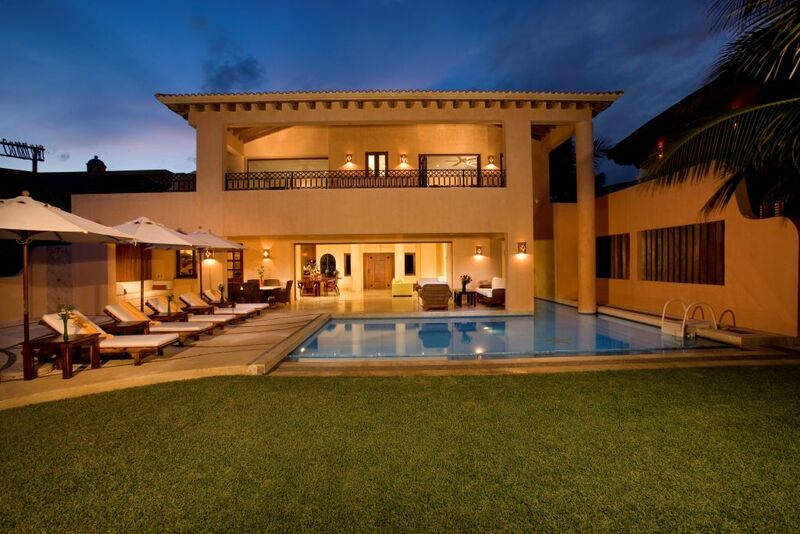 Villa Palmilla certainly captures the true essence of the perfect Caribbean holiday by making their home absolutely unforgettable! NOTE: Complimentary amenties only applies on 7 night rentals at full rate. Fabulous Villa Villa Palmilla is a beautiful villa. It is truly a pleasure the moment you walk through the gates and enter the courtyard and doesn't end. Everything is perfect---the decor, the staff, the location. Can't wait to get back next year. 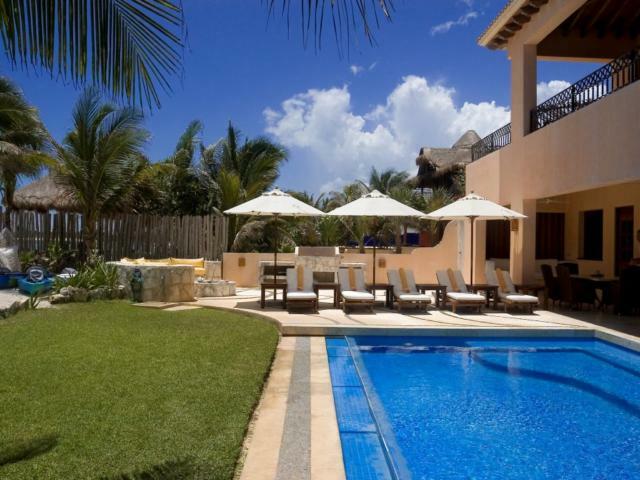 Have stayed at Villa Palmilla the past three summers. Best villa we have stayed in Akumal My family and I have stayed in many villas in south, north, half-moon bay, ya-kul lagoon and right in Akumal near the dive shop and this was by far the nicest villa on all accounts! We loved it and will mkst certainly like to go back! I a specially liked the management team that worked at the house. Roger the property manager was very friendly and accommodating, Roger the grounds keeper and amazing cook! (our best meals were at the house the whole week) and Margarite was very sweet and kept the house beautifully spotless! 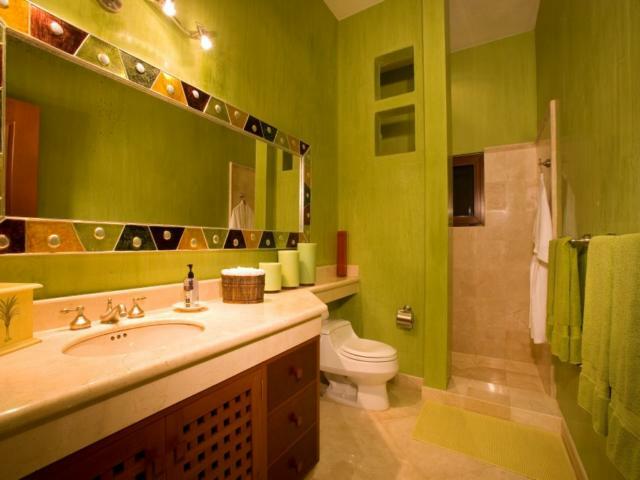 The owners need to know what an amazing house they created esthetically and every detail is impeccable! Thank you for sharing your home with us! What a wonderful arrival! 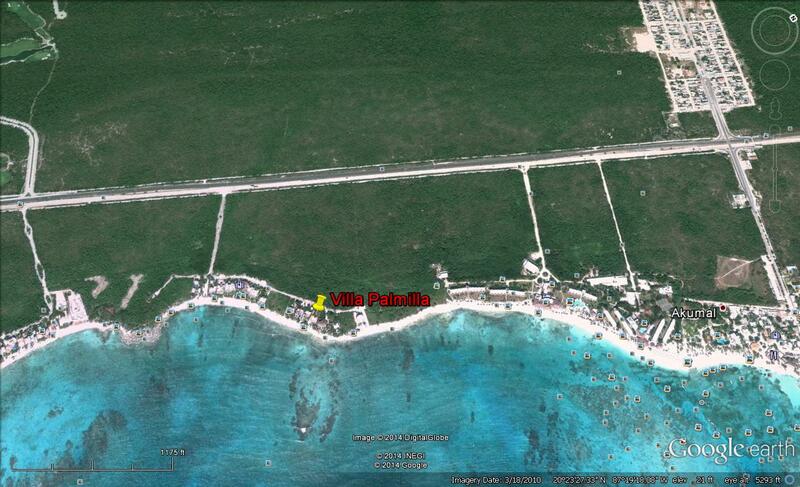 We have stayed at several houses between north Akumal and south Akumal and this one is splendid! What a wonderful, friendly staff. I can already anticipate a fabulous stay! Thank you! The Villa Palmilla es excellente! 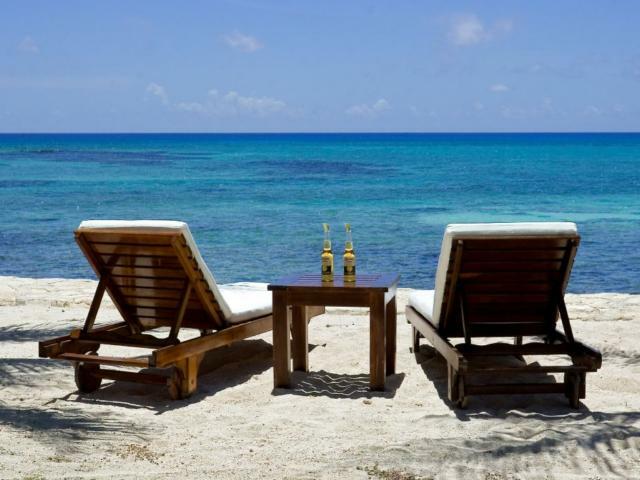 We have had a magical stay at your wonderful home; I have enjoyed my seaside perch at the end of the seawall, what a beautiful spot.We ate at the villa all but one night. Ricardo is a masterful chef. You dream it; he delivers an awesome talented chef with the heart the size of the Caribbean. Theresa was equally helpful and wonderful she kept the place beautiful and clean for us to enjoy, a very kind soul. Roger really was on top of every request that we made, he made us feel like family and he is a part of ours, he helped to create an experience for all of us that suited every need. Thank you Roger! 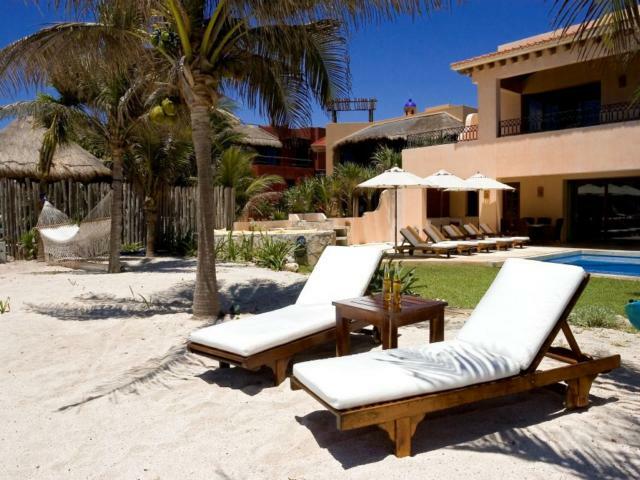 Villa Palmilla is magnificent, quality throughout! Beautiful details. Thank you for sharing it with The Wardlaw family. We don't want to leave! Thanks for opening your home to our family. The house and grounds were fabulous and the staff incredible. We are grateful for the opportunity to have shared your home. Thank you. Gracias! This place is magical and full of beautiful things and people. Ricardo is a very special person, as well as being a fantastic chef! Roger is pretty amazing, the way he pays attention to details. Margarita was beautiful every day. All staff were so kind and tolerant with our children. Thank you all for a wonderful week. What can we say! The Palmilla is gorgeous! 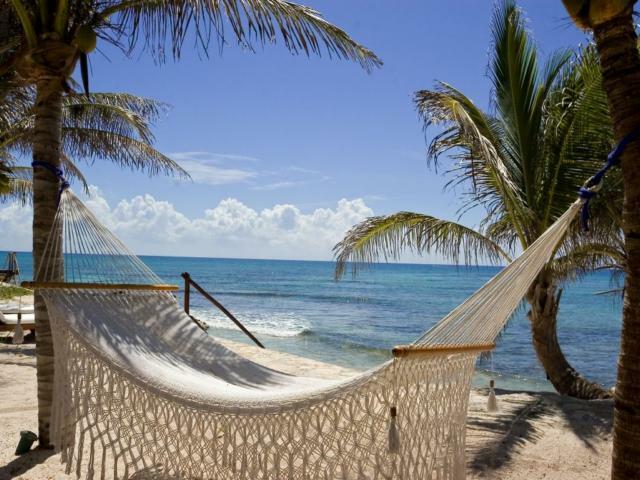 Akumal is one of the best! Staying here was the most relaxing, enjoyable and fun our family has had! The staff is excellent! Ricardo we truly love his smile and cooking, we will miss him clearly. Margarita is wonderful too!Thank you for letting us have a home away from home! 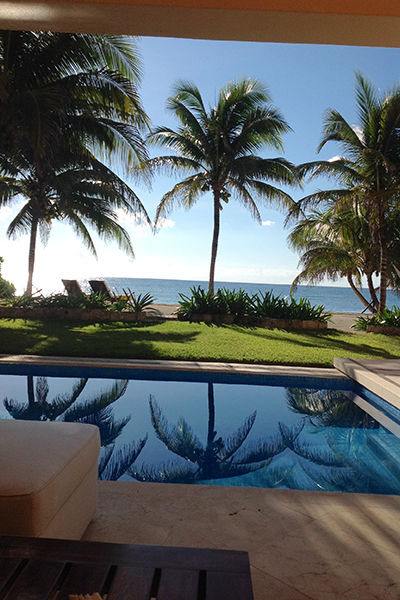 The Palmilla is a very special place and we look forward to many future vacations here!! Muchas gracias. PS Thank you for the coconut juice Ricardo. 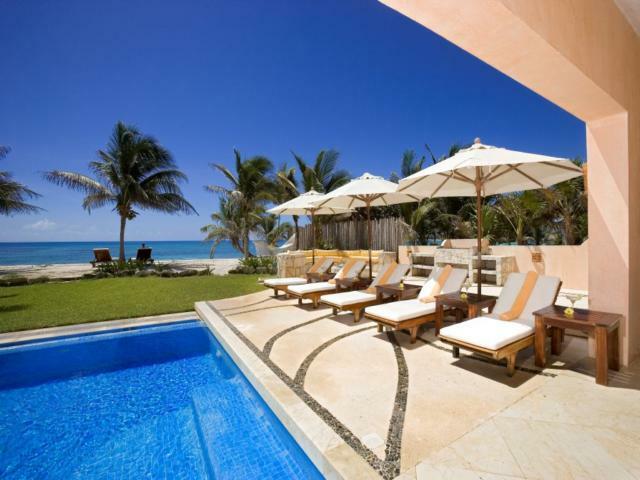 Villa Palmilla is a very special place. You should be complimented on the beauty of this home. It was perfect for me to be with my whole family to bring in the New Year! You have wonderful taste is a beautifully natural spot. Roger welcomed us immediately and made us feel so much at home.His checking in every day made us feel very secure in learning about Akumal. He was wonderful. 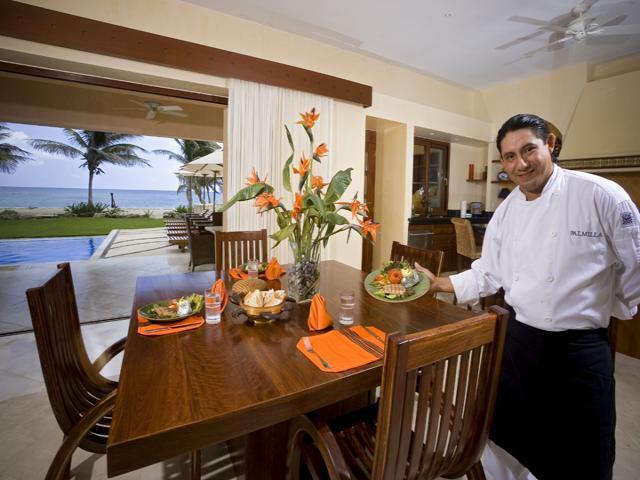 Ricardo took such special care of our needs and is a wonderful cook 5 star in our own kitchen. Every morning he started taking care of our needs and never stopped. Margarita cleaned and sewed every day taking wonderful care of your beautiful home. Both were so pleasant. 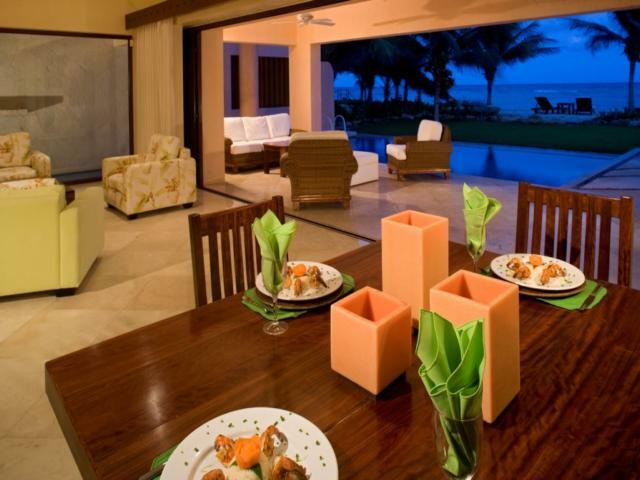 Not only would we like to return but we will recommend Villa Palmilla to Others. Thank you for allowing us to enjoy your home. We loved your home.Thank you so much for taking care of all the little details that made our vacation wonderful.We are very satisfied with the level of service from Akumal Villas; they were excellent in setting up everything and answering all our questions.Roger was wonderful in welcoming us to your home.Margarita made every corner of this house look clean, fresh and extra special.Ricardo always smiled and laughed with a wonderful sense of humor.He was so helpful with every tip we needed to know about were to go to.His cooking was delicious.Margarita and Ricardo make an excellent team to keep the house in mint condition.We don't want to leave, but we will be back hopefully to escape our busy lives. It was a pleasure staying here and we will take all our memories back home.Muchas gracias for a wonderful vacation.